Goat is a healthy meat source that has become popular in restaurants and stores. Goat meat has been consumed around the world for centuries, and it's prevalent in Mexican and Indian cuisine. Knowing the nutritional value of goat meat, along with how is regulated, classified, prepared and handled, can help you determine if goat meat is right for you. According to the Food and Safety Inspection Service, goat meat is inspected, but there is no grading system for the meat. It's classified as a red meat similar to lamb. If you've purchased lamb before, the same standards apply to goat. The FSIS states that "goat should have light pink to bright red, firm, fine-grained flesh with well-distributed white fat." Antibiotics can be present in goat meat, but the use of hormones is not approved. When handling goat meat, use the same precautions as you would with other raw meats. The FSIS recommends three different ways to thaw meat: in the refrigerator, in cold water and in the microwave. 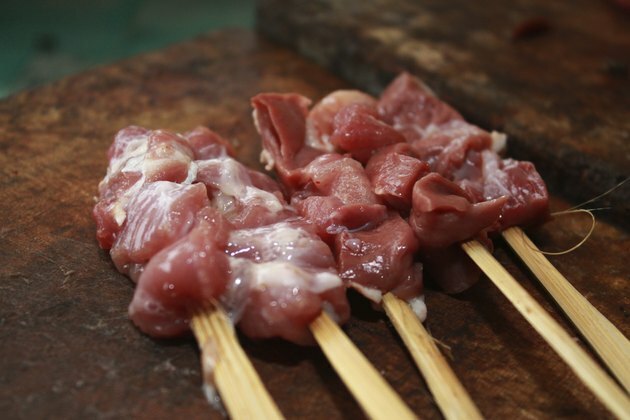 If you're thawing goat meat in cold water or in the microwave, cook it immediately after thawing. If you're cooking ground goat meat, get the temperature to 160 degrees Fahrenheit. For goat meat roasts, steaks and chops, cook the meat to at least 145 degrees Fahrenheit. You'll notice fat deposits on the meat, but these can be cut away after preparation. The nutritional value of goat meat depends primarily on the way it is prepared and how big the serving size is. A 4 oz. cooked serving of goat meat has 124 calories. There are 2.6 grams of fat, 0.8 grams of saturated fat, 25 grams of protein and 64 mg of cholesterol in this serving. Goat meat is lower in fat than chicken, but higher in protein than beef. Goat meat outshines traditional meat sources in most areas: it's lower in calories, total fat, saturated fat and cholesterol. The low levels of saturated fat and cholesterol, combined with its high iron and protein content, make goat meat a good choice for anyone looking for a healthy red meat. It's a leaner, healthier choice when compared to equal serving sizes of chicken, beef and pork.